After returning back from Taiwan trip, I was searching online to find a good deal for the mixer. Basically, I needed it to try to make nougat, after learning it from my very good friend in a Taiwan. It seemed like the Universe listening to what my heart was saying. 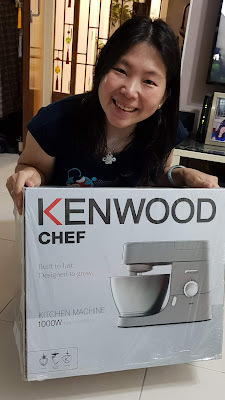 After searching high and low, one day, it led me to a very good deal of Kenwood Chef mixer from the Carousell. And when I asked the person about it, he said the offer was available from Robinson at JEM. Just like a dream came true, few days later it reached home. Wow!!! I still could not believe that in my course of life, I finally had my own mixer!!! Yes, I studied hotel management before, prepared large amount of pastries before, but it was all done in school. Never once I practised it at home afterwards. And now, almost 20 years later, I had forgotten almost everything!!! 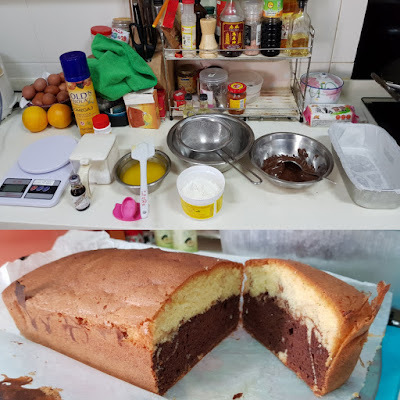 I thought I needed to make something for the start, something I liked eating :) So I did some research from YouTube on how to make the marble cake (it was my favourite during my college time as it was the only snack available at the lobby bar and was sold at a very reasonable price - SFR1.50 each). So few days ago, after the evening run near my house area, I went directly to the nearby supermarket and purchased things required to bake the cake. I went home and took a bath. 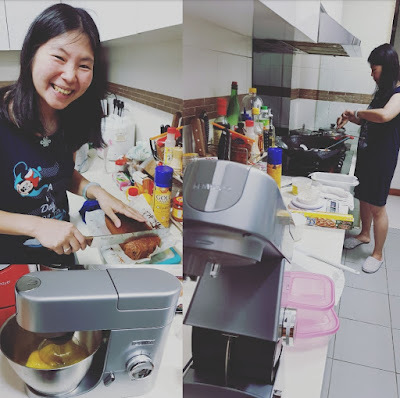 To gain some support for my first step, I shared the YouTube video with my sister-in-law and told her that I'd bake it right at that night. Hahaha... She was a bit startled with my determination and there I went!!! My first supposed "marble cake" had turned out failing miserably and turned into a "chocolate cake" instead. 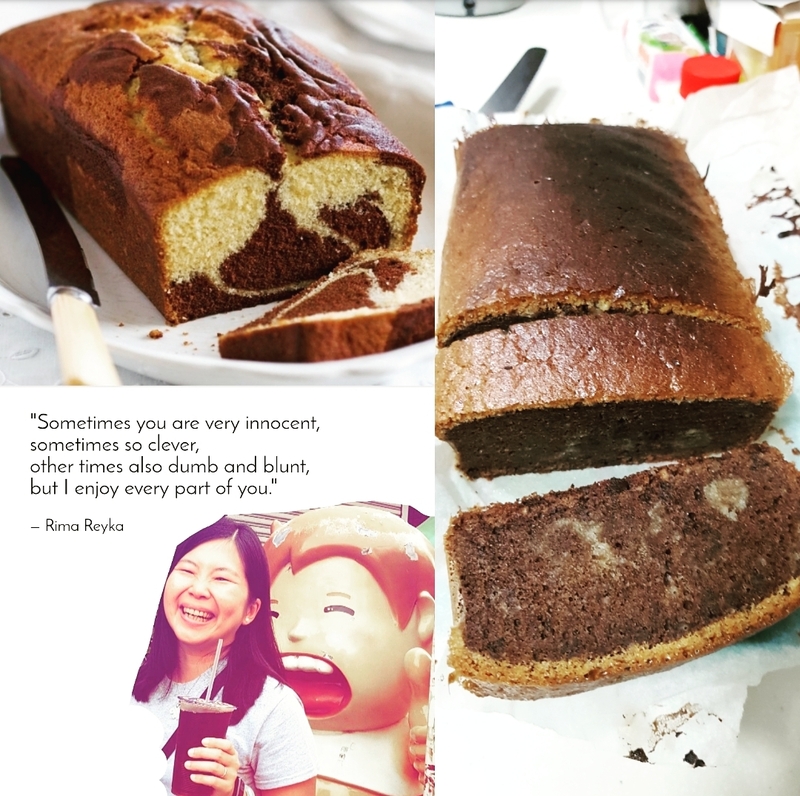 Hahaha.... :P Luckily it was still edible and the chocolate taste was good ^_^"
It had been a long time since the last time I made any cake. I had no idea what speed I had to choose and for how long to create the white thick formation from the egg and sugar. 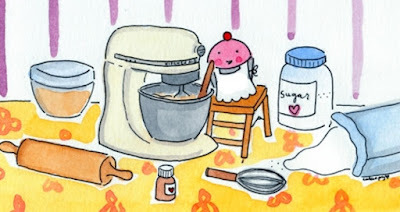 In the video, the person just showed us the result and did not mention the strength of the mixer and the duration to mix. Lol!! That was why there was no yellow white colour appeared on the cake. Well, mistake was learned and it led me to watch more videos regarding the making of the similar cakes and this afternoon, I tried it the second time!!! Tadatadaaaaa... Well, not bad!!! It's half success!!! Lol!!! Still need some improvements but at least I got the batter texture much better than before!!! It should be using stronger beat and at certain time!!! I was thinking that the chocolate gave so much weight and it sunk when I put it on second layer. Maybe next round I will just have to put less chocolate on it. Let's see!! !